While out doing the usual weekly grocery shop I came across a bacon sale. I find it hard to resist any type of sale, let alone a bacon sale. Obviously I had to partake. So I picked up two packs, one regular bacon with plans to eat with Sunday morning breakfast and one pack of a thicker cut, smoked bacon. Now what could I do with the smoke bacon? I made bacon jam last month as part of my hubby's Christmas gifts, I've made bacon wrapped water chestnuts and already know I enjoy them. I knew I enjoyed the salty and sweet combination. I love peanut butter, I love chocolate covered pretzels, I figured I should try sugary bacon. What could go wrong? 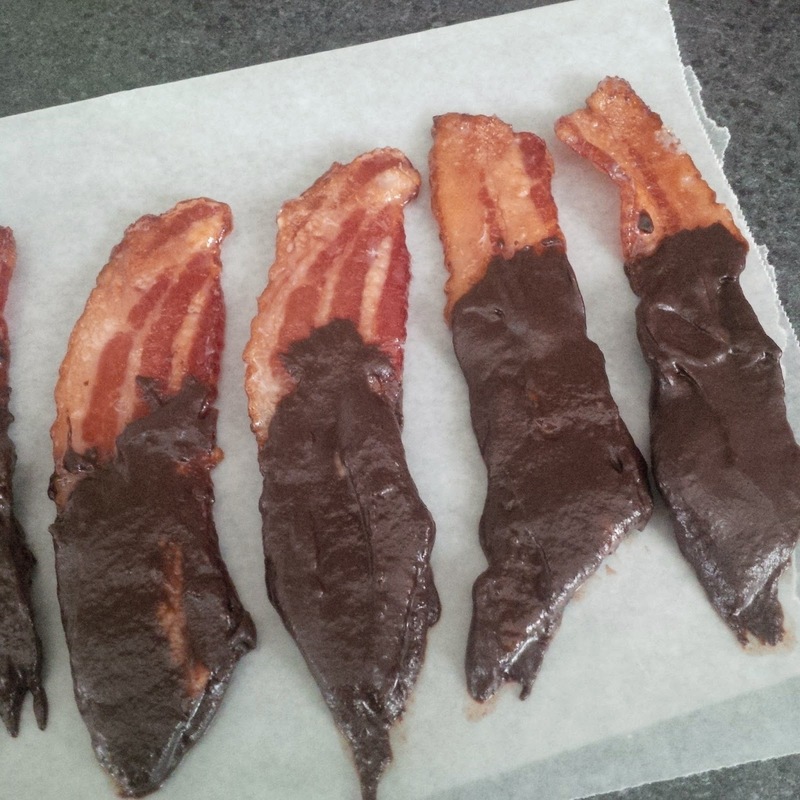 So I searched for a 'candied bacon' recipe and gave it a try. The bacon came out with a wonderfully crisp caramel flavour. It was delicious. I couldn't help but snack on it. I was thinking about what else I could do with it when my eyes fell upon the bag a bag of chocolate chips. Why not? 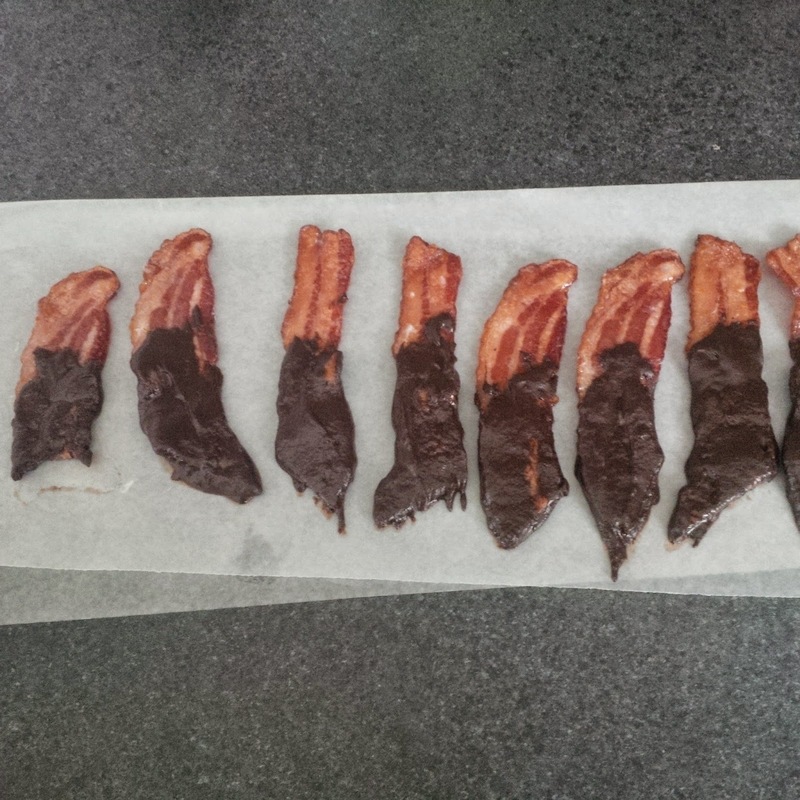 I melted the chocolate and after cutting the bacon slices in half, I dipped each piece half way into the chocolate and let it rest on wax paper to harden. Amazing. I would have never thought that chocolate covered bacon was going to be a hit, but please go try it because you will not regret it!